Merchants operating their online stores on the Magento 2 platform might face difficulties when assigning new products to categories. Unfortunately, with the out of the box functionality, this process can be done only manually. This limitation significantly slows down the routine procedure of associating products with relevant categories. Luckily, Amasty has developed a tool designed to enhance the default Magento functionality. Meet the Automatic Categories extension for Magento 2! With the module, you will be able to quickly create dynamic categories based on the specified rules and conditions. Below, we describe the features of the Magento 2 dynamic categories extension to get a better understanding of the advantages it brings to its users. Multiple ordering options for the products listing. 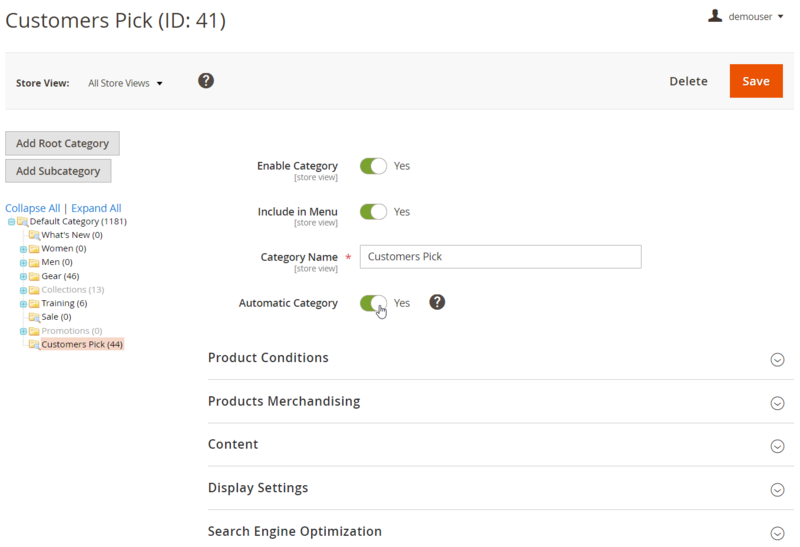 One of the significant improvements the Automatic Categories tool for Magento 2 brings to its users is the ability to assign products to categories automatically. Thus, the extension drastically improves catalog management on a Magento store and simplifies the admin routine. With the Magento 2 dynamic categories module, you will no longer need to associate each product separately within a category when there are changes in your inventory. For making the products display in the catalog more precise, the module enables you to create merchandising rules according to your marketing strategy. You can set various conditions based on product attributes to define how products should be retrieved to a category on the frontend. Besides, you can choose the price limit, rating, stock availability, as well as new or discounted products as a basis of the advanced conditions. 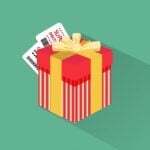 Based on the selected rules, you can run promotions or sales campaigns on your web store with a precise display of product listings on the frontend. If you have rules created for other categories that you want to apply to a new category, you can import them and save time on setting new conditions. Also, you can make changes to the imported rules if necessary. Furthermore, the Automatic Categories extension allows Magento admins to preview how the products are matched with created conditions in the backend. The handy drag-and-drop tool lets users make changes in the ordering of the items in the category. 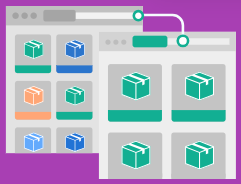 The advanced sorting options offered by the Magento 2 module enable you to customize the order of products. 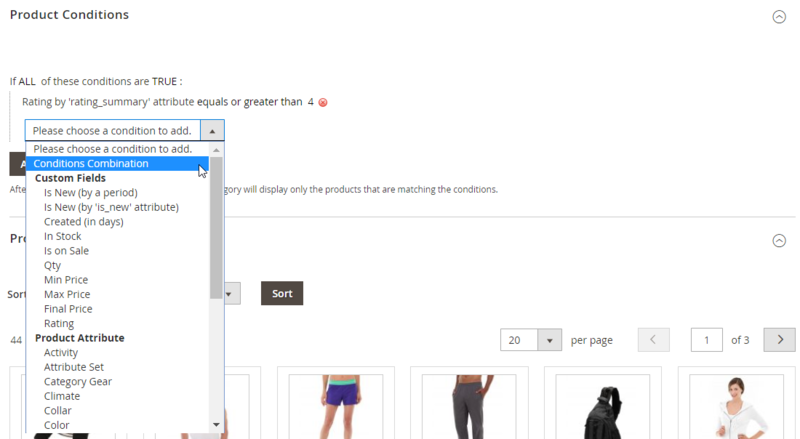 The feature gives you more control over the positioning of your store items in the catalog. This way, you can place new arrivals at the top of the product listing or sort products by name in ascending or descending order. Also, it is possible to apply the sorting by price, which is useful for running sales and promotions. To create a dynamic category, go to Catalog → Categories and choose a category that you want to make automatic. In the example below, we configure the ‘Customers Pick’ category. First, you should enable the ‘Automatic Category’ function. To select products that will be associated with the category dynamically, open the Product Conditions tab. Here, you can set specific conditions based on product attributes or their combinations, as well as apply advanced conditions. After selecting the necessary options, click ‘Apply Conditions’ for the automatic retrieval of relevant items to the product listing. 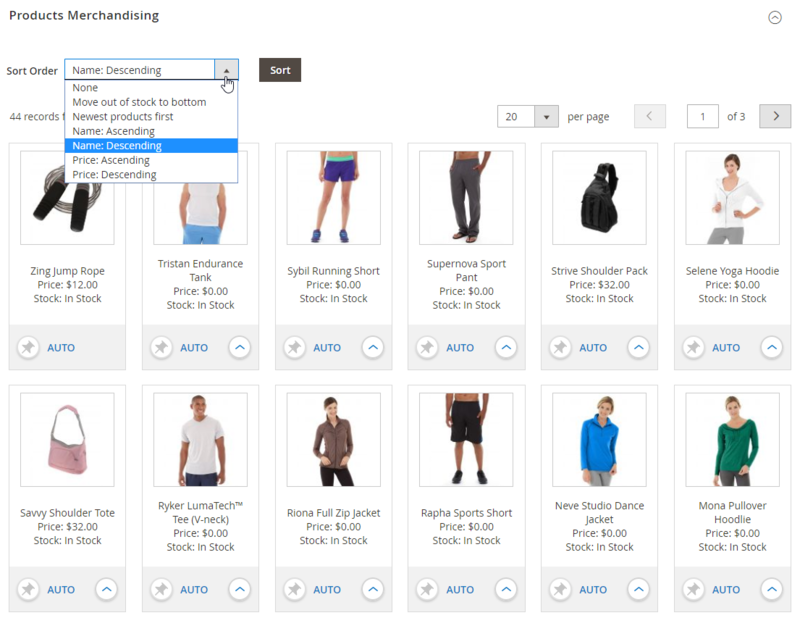 In Products Merchandising, you can select the sorting order for the products in the catalog. There are 6 different options: Move out of stock to bottom; Newest products first; Name: Ascending; Name: Descending; Price: Ascending; Price: Descending. Here, you can also leverage the drag-and-drop tool to change the position of your products according to how you want it to be displayed in the catalog. It is also possible to pin particular items to fix their place in the listing manually, as well as move products to the first position. The Magento 2 Automatic Categories extension by Amasty provides store owners with the set of tools for more efficient catalog management. The module eliminates the need for manual assignment of products to categories, simplifying routine processes on a web store. With the extension, everything is done automatically, and products are associated with categories based on the specified conditions.